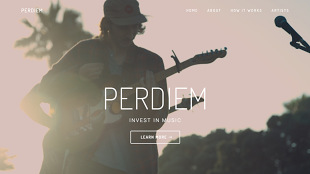 WE PERDIEM was created to give artists a new opportunity. ARTISTS THE OPPORTUNITY TO GET FUNDING BY HAVING FANS DIRECTLY INVEST their music projects. We are a collective of people that all share a passion for music and making the world a better place. We created a platform that is designed to bring a new era of the music industry by introducing a new way of financing music... and we are just getting started.